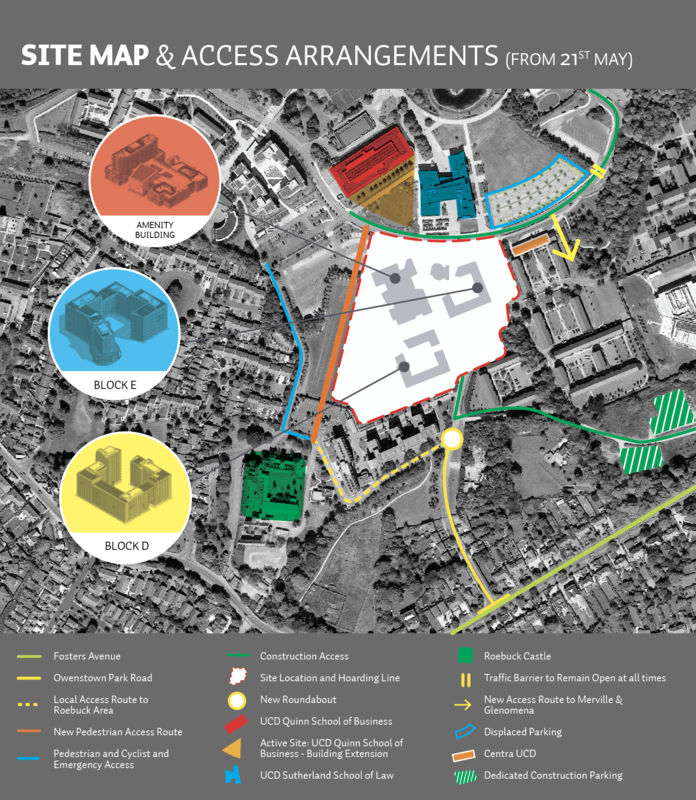 Traffic, parking & pedestrian access diversions will be in place from Tuesday 8th May to facilitate the development of phase 1 of the Student Residences Masterplan. Restricted vehicular access (local vehicle access to the Roebuck area of campus only) through Owenstown Park road from 10:30. Pedestrian & cyclist traffic will be re-routed via Roebuck. Closure of Car Park O3 and a section of O4. 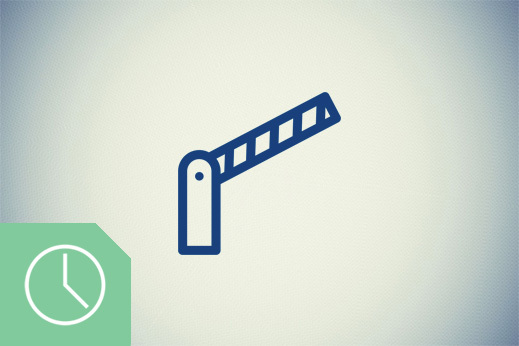 The Traffic Barrier at the Main Bus Terminus/Centra will remain open from 07:00 Monday 21st May 2108 to allow access to alternate car parks. Traffic stewards will be on duty from the morning of Monday 21st at the Owenstown Park entrance and Centra junction to advise campus users. Parking spaces displaced by the development will be relocated to the new car park currently under construction. Car park O3 and a section of O4 will be closed from 20:00. The current Merville vehicle and pedestrian entrance will be closed and relocated to the new entrance off the campus ring road opposite the main bus terminus. Signage will be in place directing campus users to the alternative access point while work is ongoing. The campus traffic calming barriers will remain in normal operation during this initial phase of the project. 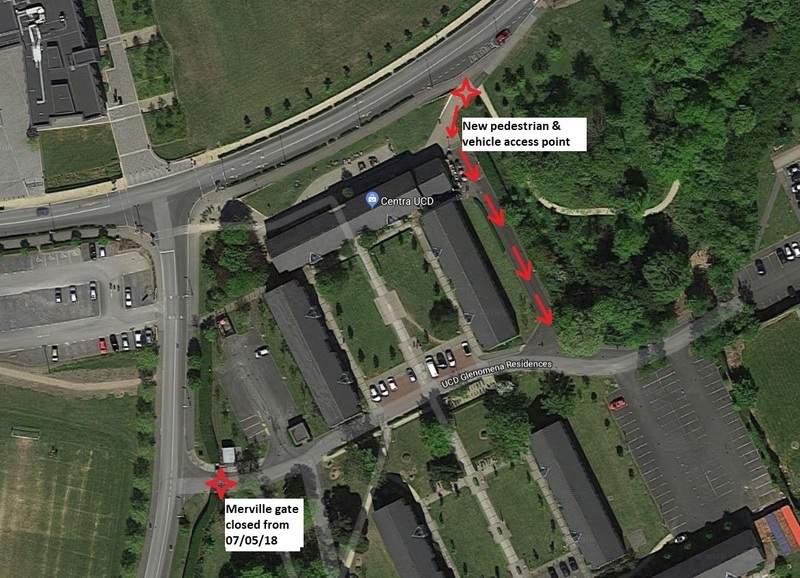 As the project continues and develops further temporary changes to campus access routes and parking may be necessary as part of the planned schedule of works. Notice will be given in advance of these changes online and through our social media channels.